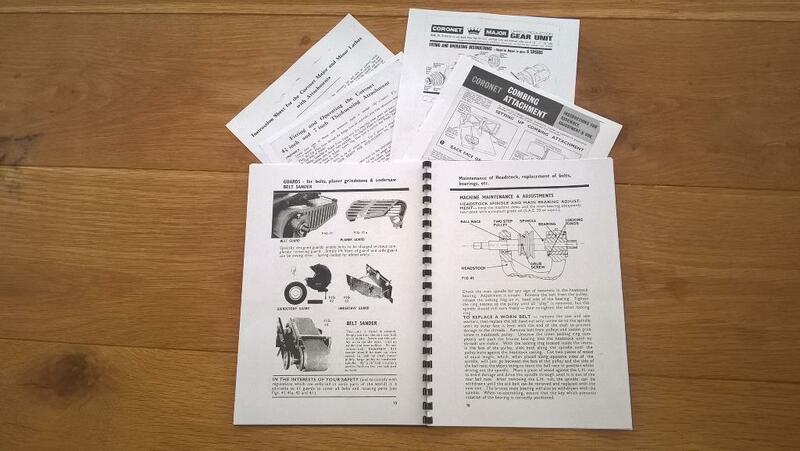 Coronet Minor/Minorette instruction manual for basic machines and attachments. How much is it? An A4 size copy of an original manual will cost you £10.00 inc p+p. Yes, I have had to put the price up after several years of no increases. Postage and printing costs have gone up and I hope to keep this price the same for several years to come. It is still the cheapest reproduction manual available and it is in A4 size unlike the much smaller original. Yeah size does matter. So what do you get for your £10.00? What you get is a scanned, cleaned and ringbound copy of the original instruction manual with precise prose and relevant pictures or diagrams. There are matt red* hard covers front and back. The manual covers two machines from the Coronet range which are the Minor and Minorette. It comes with four extra information sheets including one for the Major free of charge. And it's sent by Royal Mail 1st class signed for service. £10.00! Are you having a laugh? Just think what else you can buy for £10.00 these days...two pints of average tasting lager...three quarters of a Chinese meal for one...approx eight litres of petrol or about fifteen minutes of premier league football. So no, I am not having a laugh. How many pages is it? There are sixteen pages and four extra information sheets. A two sided factory set up instruction sheet, the fitting and operating of the 4 1/2" and 7" thicknessing attachment, the speed reduction gear unit instructions and the combing attachment instructions. See below for a nice picture. Hmmm..how can I trust you? Look, I sell approximately two dozen of these every year and have not had one single complaint but only compliments. The printing and posting of each manual adds up to 75% of the total cost. Is it ok if I pay myself £2 to ringbind it, to put it in an envelope and drive it to the Post Office for posting? If you begrudge me that you really should be having a good, hard look at yourself. Ok, I take your point now how do I order one? Paypal, cheque or bank transfer. You can pay via paypal of you have an account, post a cheque or bank transfer. My paypal account is pete@boleynworkshop.com. If you want to pay by cheque or bank transfer then email me and we can exchange details. Can you post manuals to outside of the UK? Yes. Each order will be costed up individually. I have posted manuals to mainland Europe, Northern Ireland, Eire, Australia, New Zealand, Malta and South Africa.